Appropriate evaluation of children with hearing loss means assessing the performance areas most vulnerable to challenges due to the access issues resulting from hearing loss or deafness. Tests – Informal Assessments for Parents, Students and Teachers Tests/Checklists Available from Supporting Success for Children with Hearing Loss The eligibility considerations wheel shown was developed by Karen Anderson and Lynne Price. Steps to Assessment Questions This list corresponds to each of the areas identified in the image above. 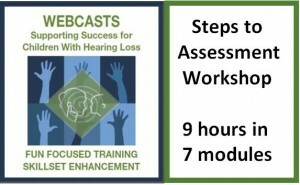 It was prepared as a supplement to Steps to Assessment for use during the 2-day Steps to Assessment Workshop presented by Karen Anderson and Lynne Price. 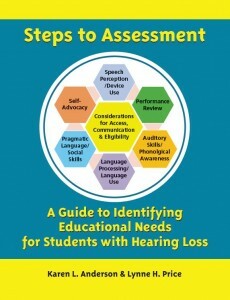 The list is designed to provide guiding questions for school teams to consider when determining eligibility and should answer the questions, “Are the selected assessment sufficient in scope and intensity to identify gaps in auditory, language, narrative discourse, academic and social language skills?” and “Has testing been conducted to provide information on a student’s typical performance in the classroom, versus optimal performance?” (i.e., a student may do very well 1:1 in quiet but not be able to keep pace in the classroom). What assessments will YOU perform to gather data about each of these functional performance areas? 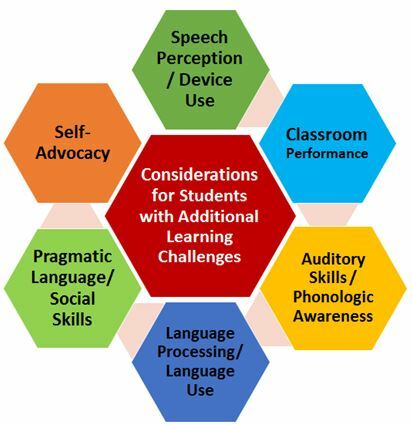 Challenges of the School Psychologist – A Teacher Topics article from 2015-2016 written by Scott Buckley, EdS, National Certified School Psychologist with the Columbus Hearing Impaired Program, Columbus, OH. National Association of School Psychologists Position Statement on Serving Students Who Are Deaf or Hard of Hearing. After long deliberation, this consensus statement was established in 2012. IDEA Sec. 300.304 Evaluation procedures. (a) Notice. The public agency must provide notice to the parents of a child with a disability, in accordance with Sec. 300.503, that describes any evaluation procedures the agency proposes to conduct. (3) Use technically sound instruments that may assess the relative contribution of cognitive and behavioral factors, in addition to physical or developmental factors. (v) Are administered in accordance with any instructions provided by the producer of the assessments. (2) Assessments and other evaluation materials include those tailored to assess specific areas of educational need and not merely those that are designed to provide a single general intelligence quotient. (3) Assessments are selected and administered so as best to ensure that if an assessment is administered to a child with impaired sensory, manual, or speaking skills, the assessment results accurately reflect the child’s aptitude or achievement level or whatever other factors the test purports to measure, rather than reflecting the child’s impaired sensory, manual, or speaking skills (unless those skills are the factors that the test purports to measure). (5) Assessments of children with disabilities who transfer from one public agency to another public agency in the same school year are coordinated with those children’s prior and subsequent schools, as necessary and as expeditiously as possible, consistent with Sec. 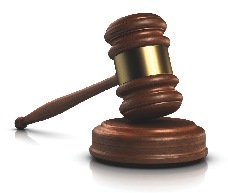 300.301(d)(2) and (e), to ensure prompt completion of full evaluations. (6) In evaluating each child with a disability under Sec. Sec. 300.304 through 300.306, the evaluation is sufficiently comprehensive to identify all of the child’s special education and related services needs, whether or not commonly linked to the disability category in which the child has been classified. (7) Assessment tools and strategies that provide relevant information that directly assists persons in determining the educational needs of the child are provided. Ear Gear – Parent’s choice as most effective for keeping hearing aids on kids! What is “normal” hearing for children?